Today is National Make a Gift Day and coincidentally it also happens to be one of our busiest days of the year! We’ve had a very busy Christmas period as those of you who have been in over the last few months will know! As usual, baubles have been our best sellers with hundreds of hand printed festive beauties having passed through our hard working kiln in the last four weeks alone. But we’ve also seen some other wonderful creations, including mince pie plates, Santa mugs and snow man tea pots. The loveliest thing for us is knowing that around 90% of the painted pottery leaving our studio is on its way to surprise a lucky recipient as a Christmas gift! There are many lucky mums and dads, grandparents, aunts, uncles and friends out there that are about to become owners of super cute baubles where tiny foot prints have been turned into reindeer or plates featuring a Christmas tree made from little hand prints. If you’re stuck for something special for a loved one- then there’s still time to make something at Crafty Monkey and have it ready in time for Christmas day. Booking is essential at this time of year, so don’t forget to call us on 01480219222 to reserve yourself a table. We’ve produced some lovely items lately using silkscreen and we’re so pleased with the results that we thought we’d be kind enough to share our secrets with you in our step-by-step guide! Here’s how we made our funky Lambretta plate! Begin by choosing the base colour for your plate. We chose white because we wanted to give our plate a stripy background so used it as a nice light colour for our first application of paint. Using a sponge, cover the plate in three coats of underglaze. You’ll need to work quite quickly as you don’t want the paint to dry out completely just yet. If you’re making a stripy plate like we did, tear up some strips of paper and dunk them in cold water. If you wanted nice neat stripes then you can cut them beautifully, but we liked the idea of having a slightly rougher effect. Lay the strips onto the plate to form stripes. Using your second choice of colour, dab the underglaze over the plate, again do three coats. You could also brush the paint on, depending on whether you want a mottled or a block colour effect. Carefully pull the strips of paper away. Time to watch paint dry! Ensure your base coats are completely dry before you attempt the next stage. Take your chosen silkscreen (in our case, a Lambretta) and lay it onto the plate, fixing it into place lightly with low tack masking tape. Before using a silkscreen, you need to thicken the underglaze up. You can buy professional thickening agents, but we mixed in cornflour which is just as effective. It needs to be the consistency of toothpaste. . Apply your underglaze by dabbing it on with your finger. You can also use small dabbing sponges for this if your prefer. Different colours can be applied to different areas of the silkscreen if you prefer. Carefully lift the silkscreen to reveal your design underneath. Your plate is now looking fab and is ready to be glazed and fired in the kiln! It seems that everybody’s on the move at the moment. Chances are that you know somebody who has recently moved or is about to move. But what do you get your loved ones for a house warming gift? Many people are already set up and simply moving from one home to another and have everything they need already. There are only so many sets of decorative glasses that you can fit in the cupboard! That’s why we’re lucky enough to see a whole plethora of ‘New Home’ based creations at Crafty Monkey! The lovely thing about DIY gifts is that you can create fantastic bespoke pieces to give your family and friends something that’s above and beyond what they’d usually expect to receive. Many people like to paint plates and personalise their own ‘New Home’ design, which is great to pop on the wall for all to admire. However if you’re looking for a simpler gift, then we have plenty of bits and pieces that can be simply embellished by your own hand. From oil burners, soap dispensers, vases and pots in all shapes and sizes; we’ve got all the cute adornments for every mantelpiece and beyond! We also paint commission orders, so if you don’t wish to do it yourself- pop along and chat to us and we’ll do the work for you. Christmas is upon us once again and our studio is swaying under the bulk of baubles once again. Each year, we think we’ve ordered enough baubles in to see us through the festive period but each year sees an increase in their popularity and we end up placing emergency orders for supplies! Last year this happened twice- the first time being at the start of October as we’d exhausted our stock of a couple of hundred! As ever, our specialty hand print robins and trees and footprint Rudolphs remained the most popular design for our baubles and the demand rose for our famous ‘mistletoes’ plates and we produced several every day. Amid the bauble and plate chaos- many other festive pieces found their way into our kiln, including standing snowmen, dancing reindeer and funky tree ornaments. If you’re thinking of coming along and creating Christmas bits, get in as soon as possible! Call us on 01480219222! What would have happened if it had been three wise women instead of three wise men who visited Jesus? They would have asked directions, arrived on time, helped deliver the baby, cleaned the stable, made a casserole and brought practical gifts. Perhaps that’s why, at Crafty Monkey we are inundated with bookings from groups of mums who are getting their Christmas gifts organised en masse. These wise ladies know that if they book in with us as a group of six or more, they not only save on the studio fee, but they get to get a catch up with the other mums and sort all their Christmas gifts out in one fell swoop! And we love having groups of mums and babies in as the studio fills up with laughter and love and makes us feel ultra-Christmassy!!! for the grandparents’ Christmas plates- or make a mark on some extra special baubles to treasure forever- round up your ladies and call us to get booked in! Check out our website for ideas of what you can make. Have you done all your Christmas shopping yet? Fret not if you haven’t even started. 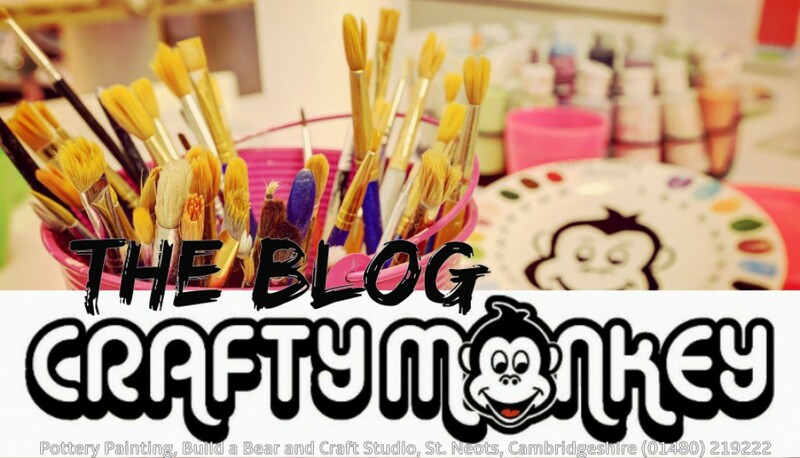 Crafty Monkey is open Monday to Friday from 10am until 5pm and Saturday 9.30am-5.30pm where you can come and purchase a gift voucher, make a bear, buy bear outfits, make silver print jewellery or paint pottery. There really is something for everyone. Mums, why not book in for the little one and we can take an impression of their hand and foot print and you can take a leaflet home to pass to Dad or the Grandparents who can give us a call to order your special jewellery piece. Easy peasy for them and you get a perfect present too! We are open on a Thursday evening until 9pm (by appointment) for adults only to come and paint in a relaxing atmostphere. We have mellow and calm tunes on the stereo and there are no kiddies so you can come along, chill out and get away from the hustle and bustle of the Christmas craziness and paint something either for you or as a present. Our Christmas range isn’t just for kids you know, after all you do need a nice dish for your peanuts don’t you! We sell hot drinks to keep you warm from the winter chill or you could always bring a tipple with you and your pals for a little Christmas get together. Perfect we say! Why not commission our Crafty Monkey resident artists to create plates or other pottery for special occasions such as Weddings, Special Birthdays (18th, 21st, 30th, 40th, 60th, 80th), Christenings, Anniversaries (Silver, Ruby, Gold), New Born, Graduations, Teacher gift, Valentine’s or just a message of love & friendship. A gift like this will last forever in the hearts of your loved ones. We are able to personalise just about any piece of pottery you see in our studio – from the smallest tea cup to the largest platter. Whether you want to choose specific colours and designs for a bespoke decorative piece, or you want a unique gift with name and date of birth or any special greeting painted on -we are able to meet your needs.